August 7th is a special day because it marks my wedding anniversary. Today Paul and I have been married 14 years. I've already blogged about our wedding, so I thought I'd talk about our honeymoon, which was so much fun. We had many fun excursions while there, even though it was August and 5 million degrees. One evening driving back to our hotel we stopped at a pizza parlor - the only restaurant for many open miles. When we walked in, there was one waitress/cook and a cowboy with his dog. We sat at the counter and while we waited for our pizzas to cook talked with the waitress and the cowboy. Turns out he'd just gotten out of jail. Yup, we dined with a convicted felon on our honeymoon. He asked if we had ever heard of Robert Earl Keen. We hadn't, not being fans of country music. Anyhow, this guy - the felon - had a country song written about him. For his devious smuggling of marijuana across the border. He told us we should visit Boquillas, a little village in Mexico, and how to get there. Ever up for adventure, we followed his instructions and parked our cars by the river. 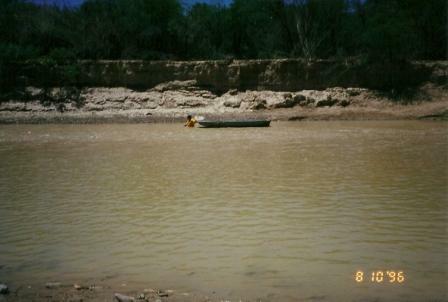 Soon enough, this guy waded across to pick us up in his rowboat. We asked if he knew our felon friend. Deep silence. Then we told him he'd sent us, and he laughed and asked how he was. True to the felon's instructions, we were able to rent burros for $2 each to ride up to the village. At the village, we dined on authetic burritos, 3 for a dollar, and icy cold Cokes in bottles. Of all the trips we've taken, it was one of our best excursions, rivaled only by the time we "accidentally" went to Sturgis and camped out in some guy's backyard. More on that another time. We also went to Terlingua, because I'd always wanted to see a ghost town. Note the date on this picture. Little did we know that some 13 years later on that very day I'd give birth to twin boys! 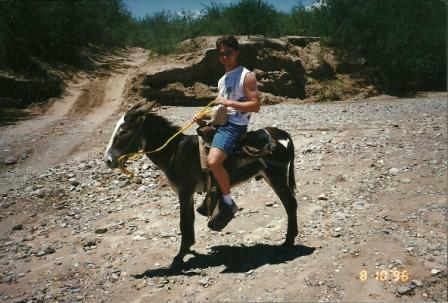 Certainly one of the most endearing and unusual things about Lajitas was their mayor. Here I am pictured with their mayor, Clay Henry Jr.
Now you might think I inserted the wrong picture here, but I didn't. Clay Henry Jr. is a goat. And he, like his father before him, had been elected mayor of the town. He also liked to drink beer. Lone Star in particular. He was, after all, a die-hard Texan. 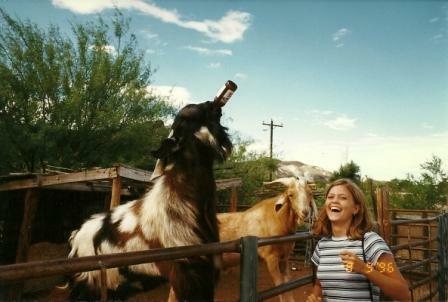 This goat could guzzle beer faster than any other college student I ever knew. Finally, we took a horse ride. 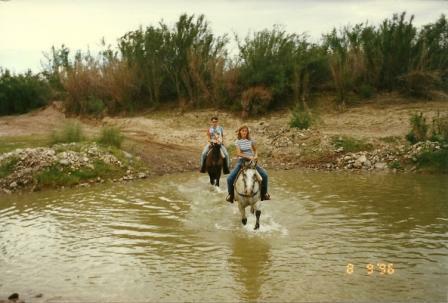 Here are Paul and I, crossing back over the Rio Grande by horseback. It was an awesome honeymoon. I love that we went there in off-season, so we didn't encounter a bunch of tourists. 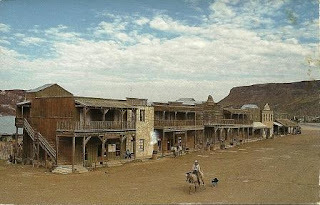 Today, Lajitas Texas has a big resort. I'm glad we got to see it before it got 'big'. Happy anniversary, Paul! May we have many more adventures ahead of us. Happy Anniversary!! Your honeymoon looks like lots of fun. I'll have to make a visit to Texas one of these days! You are just too sweet! No wonder you & Paul make such a great pair...:) Happy Birthday to Baby A & Baby B...what a celebration at your house the 7th is!! Happy anniversary to a beautiful couple - love you both. I love that story because it's such a great adventure. Those are great photos of the southwest. And the mayor!! What a wonderful honeymoon adventure! We camped in the park in 2004. So post 9/11, a lot of changes came to the border. 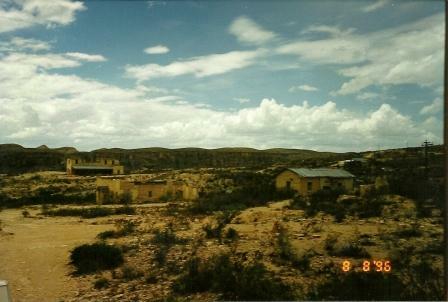 The town of Boquillas has suffered greatly for it. Our most favorite memory was an early morning hike in Boquillas Canyon. We noticed some wild burros that had their ears at attention, like they were listening to something. And then we heard it. In the quiet of dawn by the Rio Grande, we heard the most joyous singing, echoing off the canyon walls. A man walking from the town of Boquillas approached his spot along the river, carefully pulled his wares from among the rocks, waded (illegally since 9/11) across the river, and placed them on display on the US side. He placed a sign and a jar beside them and waded back across the river. 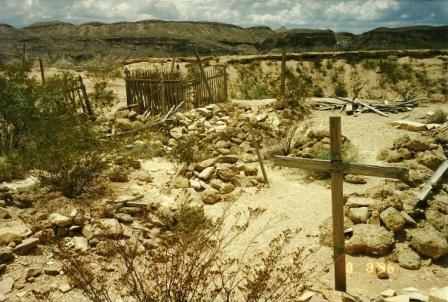 His wares consisted of crafts made by the residents of Boquillas. Knowing the harsh times the town was facing, we purchased a couple of walking sticks made from sotol cactus stems, decorated by the children of the village. They now hang on a wall in my home beside a couple of photos from that trip. I smile every time I look at them.